Damage in the external, middle, or internal ear can contribute to the emergence of tinnitus because of the hearing loss it causes. The two components of the external ear are the auricle and the outer auditory canal. The occlusion of the ear canal produces an alteration in sound transmission that may cause tinnitus to develop. Ear canal inflammation may cause tinnitus. The middle ear is an impedance transformer and the site of several pathologies that all may cause tinnitus. Acute otitis is accompanied by fever, strong pain in the ear, conductive hearing loss, and discharge from the ear. Otitis media with effusion is a chronic presence of seromucous secretions in the middle ear cavity without signs of acute inflammation. Otitis media is an inflammation of the middle ear causing conductive hearing loss. Cholesteatoma is a mass of keratinizing squamous cells or epithelial debris that may occur in the middle ear cavity; it can erode body structures. Otosclerosis involves a bony formation around the stapes, impeding its motion. The first symptom of otosclerosis is often tinnitus. Tinnitus often occurs in association with hearing loss of cochlear origin. 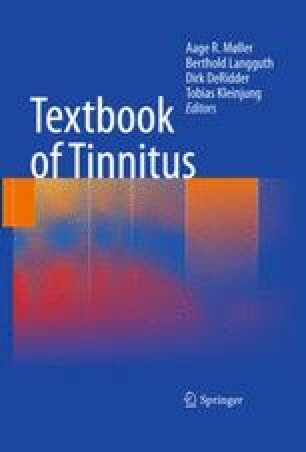 Acoustic trauma is one of the most common risk factors for the development of tinnitus and one of the major causes of permanent sensorineural hearing loss. Administration of ototoxic drugs can cause hearing loss, tinnitus, and vertigo or dizziness. Age-related changes can cause tinnitus and hearing loss. Tinnitus is one of the three symptoms that define Ménière’s disease. Changes (decrease) in cochlear blood perfusion can lead to cochlear damage with hearing loss and tinnitus. Abrupt change in barometric pressure (barotraumas) can cause damage to the cochlea and may lead to tinnitus. Hearing loss due to ear diseases may trigger a series of reactions in the central nervous system, which leads to the tinnitus. Head trauma can lead to tinnitus, and balance disorders are very common after mild to severe head traumas.